THE IRISH AIRLINE Pilots’ Association (Ialpa) has announced that its Ryanair pilot members have unanimously voted to accept the collective agreement reached with the company last month. The proposed agreement, which covers base transfers, command upgrades and related seniority principles, is the result of mediated talks between elected representatives of Ryanair pilots in Ireland, supported by the Irish Congress of Trade Unions (ICTU) and Fórsa officials, and Ryanair management. The announcement has come following months of numerous strikes held by Ryanair pilots. The pilots requested improved terms on issues including leave, promotion and base transfers. An agreement had been reached between pilots and Ryanair over the ongoing industrial dispute on 23 August. It came following a 22-hour negotiating session. IALPA members were then consulted on the agreement by way of secret ballot, which was launched on 24 August. In a statement, IALPA said that today’s result “shows that 100% of pilots believe this proposal to be the first step towards providing transparency and fairness for Ryanair pilots while also assisting Ryanair in recruiting and retaining pilots in the future”. How seniority is determined and allow every pilot to see their own position on the seniority list in relation to every other pilot. How seniority will be used to determine a range of issues such as voluntary and involuntary base allocation and transfer, selection for command upgrade and selection for redundancy. It will allow pilots to bid for vacancies for promotion, base transfer and leave. A number of other agreements have also been made between the union and Ryanair. 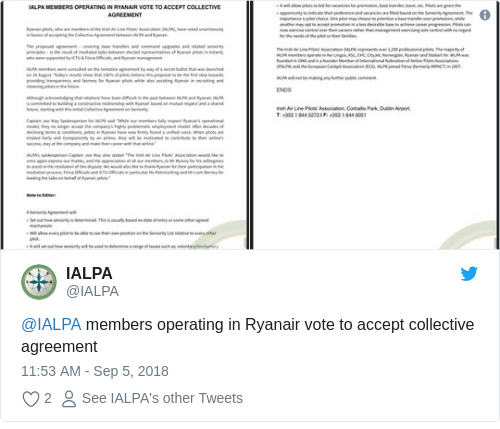 IALPA said that although relations have been difficult in the past between the union and Ryanair, it is committed to the creation of a constructive relationship with Ryanair, starting with the collective agreement on seniority. “While our members fully respect Ryanair’s operational model, they no longer accept the company’s highly problematic employment model,” captain Joe May, spokesperson for Ialpa said. “After decades of declining terms and conditions, pilots in Ryanair have now firmly found a unified voice. When pilots are treated fairly and transparently by an airline, they will be motivated to contribute to their airline’s success, stay at the company and make their career with the airline,” May said. May thanked Workplace Relations Commission director general Kieran Mulvey for his role in the talks, Ryanair for their participation in the mediation process and officials from Fórsa and ICTU. Ryanair has been contacted for a statement but has not replied at the time of publication.